Boynton Beach transportation service and car service can provide you with a variety of different vehicles to provide you transportation throughout Palm Beach County, FL. Reserve a private town car service to Boynton Beach upon your arrival to one of the surrounding airports in South Florida. Plan a romantic evening out and celebrate your birthday, night on the town, and more. 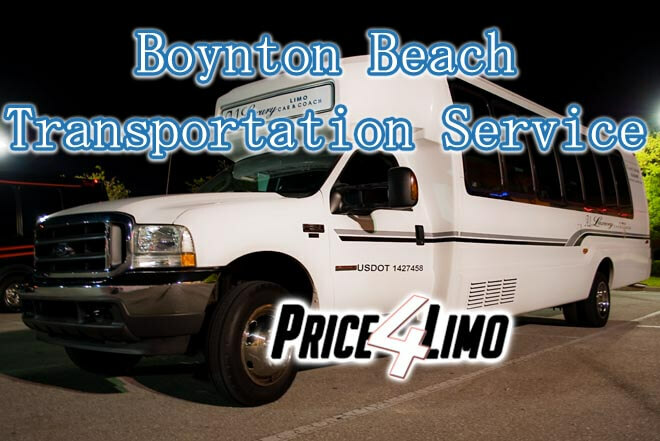 Looking to make your way to the beach with your friends and have a fun day out reserve a Boynton Beach shuttle that can sit up to 50 passengers at a time. Our Boynton Beach limousines will have you feeling like a rock star as you ride in some of the most stylish and attention grabbing vehicles. 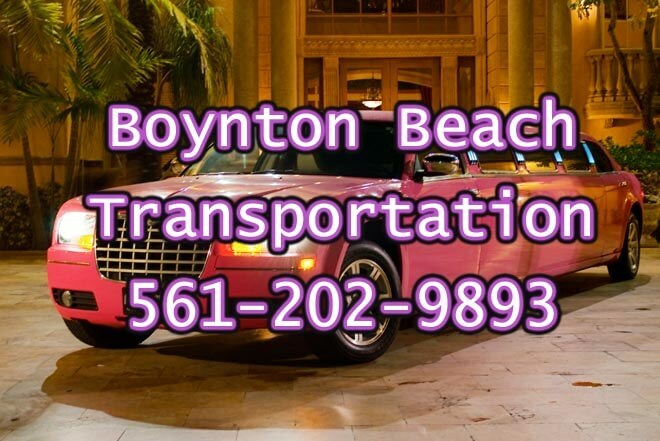 Boynton Beach transportation services has you riding in a variety of different types of vehicles for hire. Just provide us the one you are looking for and we will make it happen for any type of celebration. Our car service in Boynton Beach has you getting from one location to the next just to make an important corporate event or just need a ride to the airport. Price 4 Limo provides you a fleet of vehicles for hire that you can choose from that fits the right occasion for you, your friends and family. 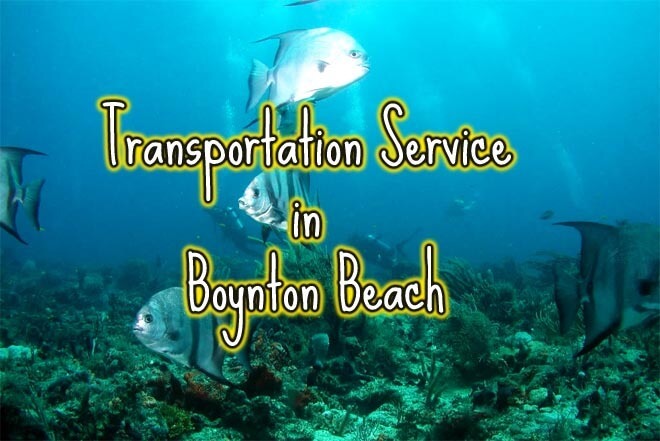 Boynton Beach transportation service can have you planning a fun day in the sun as you head out to Boynton Beach, Briny Breezes, or Ocean Ridge. Go snorkeling or diving at Underwater Explorers and Splash Down Divers. Check out the coral reefs and some of the most exotic fish you will find during your dive. Reserve a shuttle service in Boynton Beach and make it fun outing for everyone as they get to experience what very few people get to. Choose from a variety of different shuttle buses depending on the size of your traveling party. A limo bus in Boynton Beach can sit up to 14 passengers, our mini bus can sit between 20-32 passengers and our coach bus can sit up to 50 passengers. You can enjoy the mini bus and coach bus a bit more as you watch a movie or TV in the large LCD screen that is installed inside these vehicles. All of our shuttle services in Boynton Beach have leather interior and surround sound system. If you are looking to make a splash with a different style of transportation service in Boynton Beach, party like a rock star in one of our limousine services. Boynton Beach limos can have you riding in our exotic and luxurious vehicles such as the Zebra Hummer, Pink Chrysler 300, Escalade Limousine, and much more. Reserve our limos today and celebrate a birthday, night on the town, wedding, anniversary and even a divorce party with your friends. Plan out any kind of event and we'll be there to pick you up as you get your party started right. Walk into some of the hottest clubs around such as Blue Martini, Delux Nightclub, or Club Boca just to name a few and have everyone taking pictures with their phones as you arrive in style. Not looking to grab too much attention to yourself as you celebrate an anniversary or a night on the town with a significant other? Reserve a Boynton Beach car service and have us take you to where you need to go. Don't bother with yellow cab companies you will need to call back to come pick you up once you get off and enjoy your night. Our car service in Boynton Beach will drop you off and wait for you once you are ready to go home. Our chauffeur service can also provide you with airport transportation service from Palm Beach airport, Boca Raton airport, and even Ft Lauderdale airport. A quick jump on I-95 and we'll be getting you to your destination in no time. Whether it is a ride to a hotel near the airport or to a hotel near Boynton Beach. With our leather interior and clean vehicles you do not have to worry about getting treated like a number we provide you a personal one on one experience yellow cab companies cannot offer. Boynton Beach transportation service will have you choosing from a variety of vehicles through our website Price for Limo. Get a quote within 20 seconds to anywhere around Palm Beach County, FL Making the decision might not be easy but whether you reserve a town car, shuttle, or a limousine Boynton Beach transportation service has the right vehicle for the right occasion. Celebrate a birthday, wedding, prom, divorce party, bachelor party, or just escape for a few hours and have some fun out on the town. Transportation services in Boynton Beach can be for a beach trip, a ride to the airport, or a corporate event that you need to be able to transport yourself or a group of employees to. The selection is up to you what it is you need it for. Ask about getting free entrance or drink passes when you visit some of the following locations during your limousine rental!